The one common thread in modern U.S. foreign policy is an insistence on “free market” solutions to the world’s problems. That is, unless you’re lucky enough to live in a First World ally of the United States or your country is too big to bully. So, if you’re in France or Canada or – for that matter – China, you can have generous health and educational services and build a modern infrastructure. But if you’re a Third World country or otherwise vulnerable – like, say, Ukraine or Venezuela – Official Washington insists that you shred your social safety net and give free reign to private investors. Thus, in today’s U.S. parlance, “democracy” has come to mean almost the opposite of what it classically meant. Rather than rule by a majority of the people, you have rule by “the market,” which usually translates into rule by local oligarchs, rich foreigners and global banks. 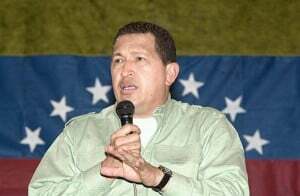 The late Venezuelan President Hugo Chavez. Governments that don’t follow these rules – by instead shaping their societies to address the needs of average citizens – are deemed “not free,” thus making them targets of U.S.-funded “non-governmental organizations,” which train activists, pay journalists and coordinate business groups to organize an opposition to get rid of these “un-democratic” governments. So, it’s okay for the U.S. to label people who are paid by foreign entities to influence U.S. policies as “foreign agents” – and to imprison people who fail to register – but not for Russia to do the same. A number of these NGOs in Russia and elsewhere also are not “independent” entities but instead are financed by the U.S.-funded National Endowment for Democracy (NED) and the U.S. Agency for International Development. There is even a circular element to this U.S. complaint. Leading the denunciation of Russia and other governments that restrain these U.S.-financed NGOs is Freedom House, which marks down countries on its “freedom index” when they balk at letting in this back-door U.S. influence. However, over the past three decades, Freedom House has become essentially a subsidiary of NED, a bought-and-paid-for NGO itself. That takeover began in earnest in 1983 when CIA Director William Casey was focused on creating a funding mechanism to support Freedom House and other outside groups that would engage in propaganda and political action that the CIA had historically organized and financed covertly. Casey helped shape the plan for a congressionally funded entity that would serve as a conduit for this U.S. government money. Nuland then handpicked who would be the new leadership, telling U.S. Ambassador Geoffrey Pyatt that “Yats is the guy,” referring to “free market” politician Arseniy Yatsenyuk, who not surprisingly emerged as the new prime minister after a violent coup ousted elected President Viktor Yanukovych on Feb. 22, 2014. On top of Ukraine’s horrific death toll, the country’s economy has largely collapsed, but Nuland, Yatsenyuk and other free-marketeers have devised a solution, in line with the wishes of the Washington-based International Monetary Fund: Austerity for the average Ukrainian. In other words, these “reforms” are designed to make the hard lives of average Ukrainians even harder – by slashing pensions, removing work protections, forcing people to work into their old age and making them pay more for heat during the winter. Other prominent Americans have been circling around Ukraine’s “democratic” opportunities. For instance, Vice President Joe Biden’s son Hunter was named to the board of directors of Burisma Holdings, Ukraine’s largest private gas firm, a shadowy Cyprus-based company linked to Privat Bank. Privat Bank is controlled by the thuggish billionaire oligarch Ihor Kolomoysky, who was appointed by the Kiev regime to be governor of Dnipropetrovsk Oblast, a south-central province of Ukraine. In this tribute to “democracy,” the U.S.-backed Ukrainian authorities gave an oligarch his own province to rule. Kolomoysky also has helped finance paramilitary forces killing ethnic Russians in eastern Ukraine. Burisma has been lining up well-connected American lobbyists, too, some with ties to Secretary of State John Kerry, including Kerry’s former Senate chief of staff David Leiter, according to lobbying disclosures. So, it seems even this modern form of “democracy” has some “sharing the wealth” aspects. 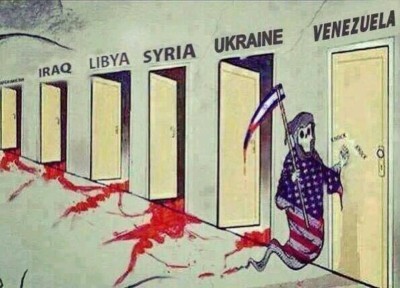 Which brings us to the worsening crisis in Venezuela, a South American country which has been ruled over the past decade or so by leftist leaders who – with broad public support – have sought to spread the nation’s oil wealth around more broadly than ever before, including paying for ambitious social programs to address problems of illiteracy, disease and poverty. While there were surely missteps and mistakes by the late President Hugo Chavez and his successor Nicolas Maduro, the Chavista government has made progress in addressing some of Venezuela’s enduring social ills, which had been coolly ignored by previous U.S.-backed rulers, such as President Carlos Andres Perez, who collaborated with the CIA and hobnobbed with the great and powerful. I was once told by an Andres Perez assistant that the Venezuelan president shared his villa outside Caracas with the likes of David Rockefeller and Henry Kissinger, bringing in beauty pageant contestants for their entertainment. Chavez and Maduro at least have tried to improve the lot of the average Venezuelan. However, facing a deepening economic crisis made worse by the drop in world oil prices, Maduro has found himself under increasing political pressure, some of it financed or inspired by Washington and supported by the rightist government in neighboring Colombia. Maduro has reacted to these moves against his government by accusing some opponents of plotting a coup, a claim that is mocked by the U.S. State Department and by the U.S. mainstream media, which apparently doesn’t believe that the United States would ever think of staging a coup in Latin America. This week, the White House declared that the evidence of any coup-plotting is either fabricated or implausible, as the New York Times reported. President Barack Obama then cited what he called “an extraordinary threat to the national security of the United States” from Venezuela and froze the American assets of seven Venezuelan police and military officials. The fact that Obama can deliver that line with a straight face should make any future words out of his mouth not credible. Venezuela has done nothing to threaten the “national security of the United States” extraordinarily or otherwise. Whatever the truth about the coup-plotting, Venezuela has a much greater reason to fear for its national security at the hands of the United States. But in this up-is-down world of Official Washington, bureaucrats and journalists nod in agreement at such absurdities. A few weeks ago, I was having brunch with a longtime State Department official who was chortling about the pain that the drop in oil prices was inflicting on Venezuela and some other adversarial states, including Iran and Russia. I asked why the U.S. government took such pleasure at watching people in these countries suffer. I suggested that it was perhaps more in U.S. interests for these countries and their people to be doing well with money in their pockets so they could shop and do business. His response was that these countries had caused trouble for U.S. foreign policy in the past and now it was their turn to pay the price. He also called me a “Putin apologist” when I wouldn’t agree with the State Department’s line blaming Russia for all of Ukraine’s ills. But the broader question is: Why does the United States insist on imposing “free market” rules on these struggling countries when Democrats and even some Republicans agree that an unrestrained “free market” has not worked well for the American people? It was “free market” extremism that led to the Great Depression of the 1930s and to the Great Recession of 2008, the effects of which are only now slowly receding. Further, real democracy – i.e., the will of the majority to shape societies to serve the many rather than the few – has turned out also to be good economics. American society and economy were arguably strongest when government policy encouraged a growing middle class from the New Deal through the 1970s. To be sure, there were faults and false starts during those decades, but experiments with an uncontrolled “free market” have proven catastrophic. Yet, that is what the U.S. government seems determined to foist on vulnerable countries whose majorities would prefer to make their societies more equitable, more fair. And beyond the negative social impact of the “free market,” there is the danger that conflating policies that cause economic inequality with democracy will give democracy a very bad name.